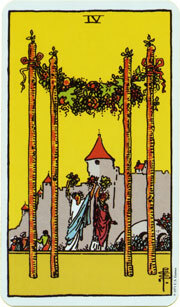 The Four of Wands. Completion. Order. Fulfillment. Security. Law. Friendship. Celebration. Festivity. The Four of Wands corresponds to the Sefirot Chesed: condensation, stability, and growth. The energy of Wands, when it flows through the Sefirot Chesed, is then solidified and made stable in a way that none of the previous Sefirot do. In the Naples Arrangement, four is the first appearance ofmatter. One is the divine spirit and the point, two is initial manifestation and distance, three is he birthing ground of the idea and the plane, and four, then, is when we as humans can finally fully experience and understand the energy of Wands as it shows itself in our world, as finally there is matter. Completion is the stable, healthy, growing aspect of the suit of Wands, and represents how its positive energies show themselves in our lives. The Four’s aspect of Order and Law represents that order and law that is given to the people by the individuals described by Dominion and Virtue: these people, driven by the element of fire, go forth and define the world, and so through their actions the energy of Wands trickles down to those who do not necessarily possess the fiery passion of Wands themselves. To go along with this, the Four’s aspect of Security is again provided by the visionary, passionate leaders who shape the world and lay out the law for the protection of all. And when one is secure, what should one do but celebrate? The festive aspect of the Four of Wands completes circle that brings completion and fulfillment: the joy of celebration and friendship and the security of law and order, coming together to provide a safe place for passion to be expressed. The Four of Wands is the solid manifestation of the energy of the element of Fire, and demonstrates how it plays a role in our lives every day. The Rider-Waite art depicts a merry group of friends celebrating, emphasizing the festive nature of the card. The Thoth illustration, on the other hand, emphasizes the idea of completion and security, with four wands surrounded by a thick-walled circle, both providing fulfillment and protection – in a way, like a toned-down World or Universe (XXI). In a reading, the Four of Wands asks one to examine how friendships, security, order, the law, and the passionate joy of celebration (similar to the divine drunkenness of Lust, but toned down significantly) are influencing your life. Reversed, this card tells you to examine how these energies in your life may have become blocked or twisted – is your security really secure? What are the qualities of your friendships? Do you feel complete? Do you go out and celebrate the joy of life enough?